My next tasting experience takes me down to Fort Pierce and to Joy’s Ice Cream Plus. 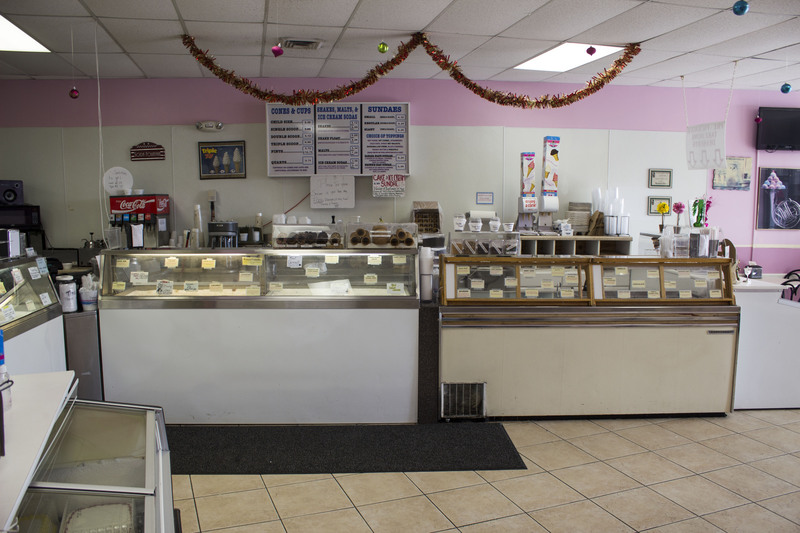 Ice cream tends to be a favorite in our house, but we don’t bring it home from the grocery store too often. I work from home and I don’t seem to have much willpower against sweet stuff, so we just go out on special occasions to have a treat. 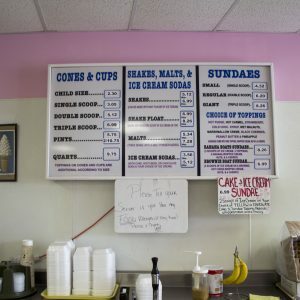 My wife got her love of ice cream from her mother, Ruth who called it her “nightly medicine”. 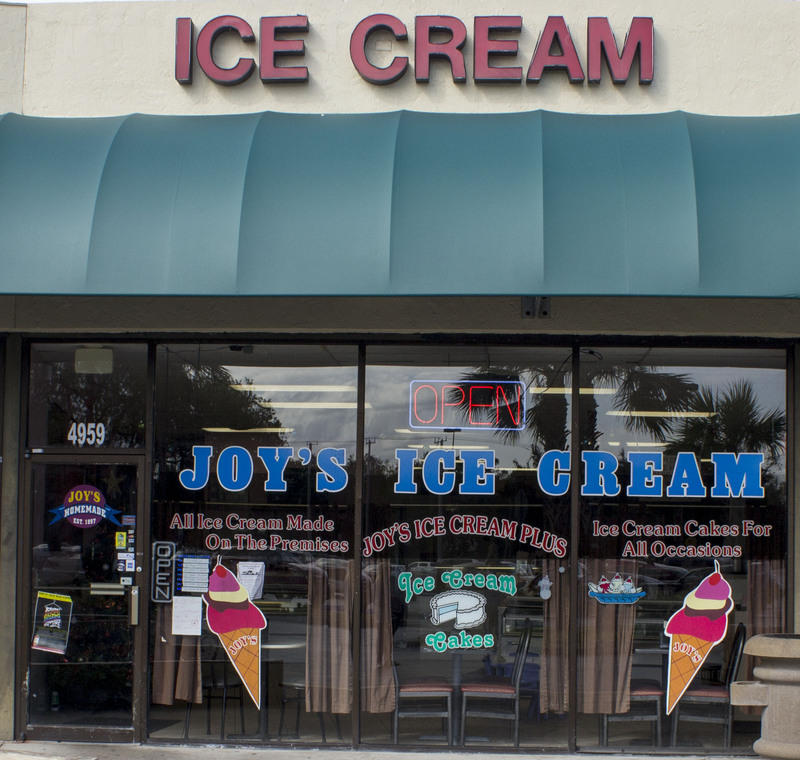 Joy’s has two locations, one in Fort Pierce and one in Port St Lucie. 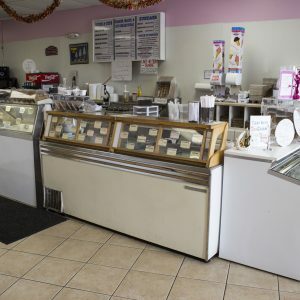 The Fort Pierce location is conveniently located in a strip mall just off of US Hwy 1. Since I had not been here before, I used my GPS to guide me to their location and I’m glad I did. While their address is on US Hwy 1, they are around the corner and not directly visible from the highway. Upon entry, it was much larger inside than I expected. Pink and white adorn the walls and make it feel bright and cheery. 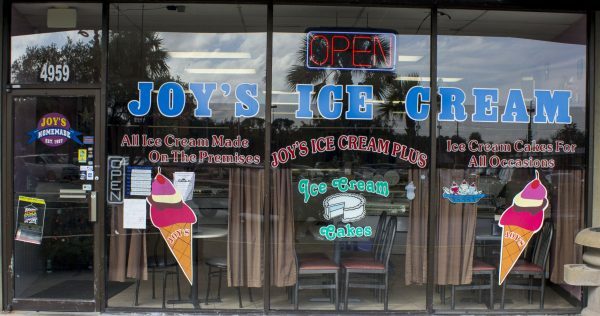 While Vero does have some great ice cream options, is Joy’s worth the drive down to Fort Pierce? You will just have to keep reading to find out! Now let’s dive right in and see what this place has to offer and what I had to eat! 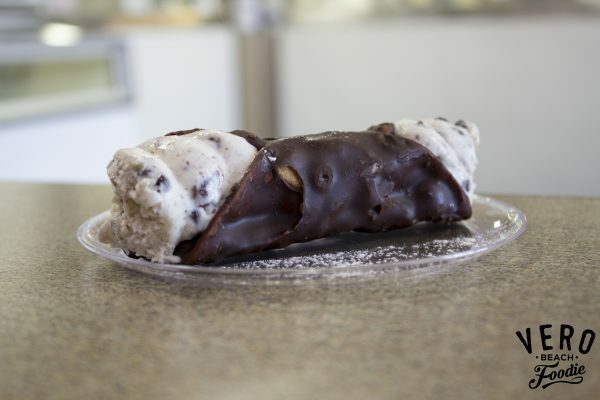 Chocolate Cannoli – Nothing says Italian quite like a cannoli! I have to say this is the first time I‘ve seen one stuffed with ice cream. 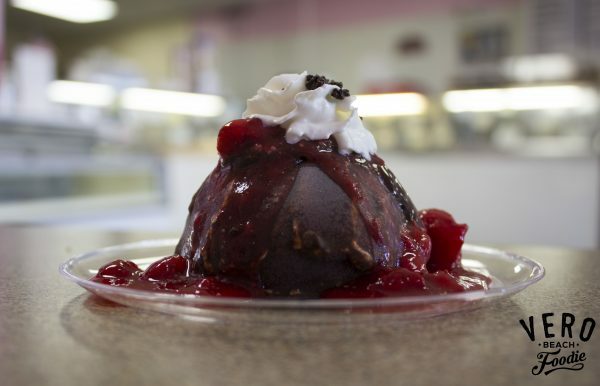 The filling was vanilla ice cream that had a subtle cannoli flavor with mini chocolate chips in it. 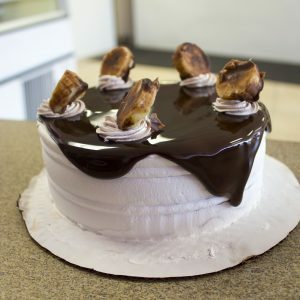 The cannoli shell was coated in chocolate and was not as hard to bite through as I thought it would be. 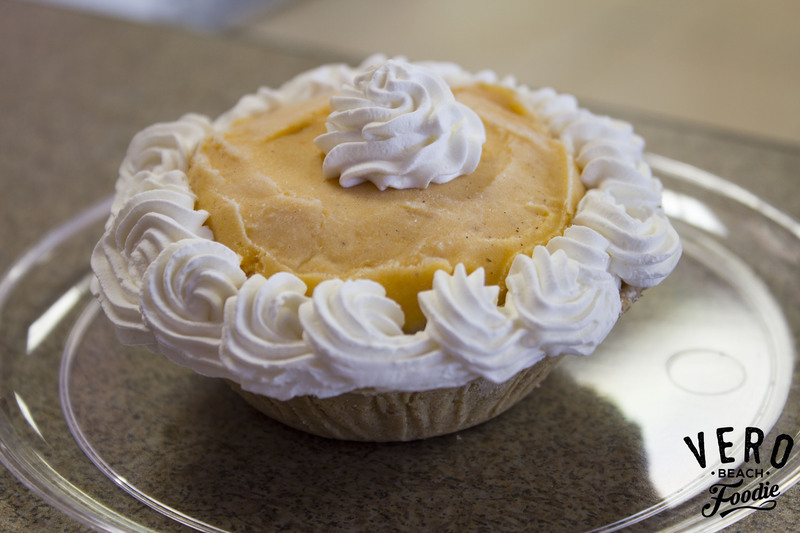 They fill it just before it’s served so it is not frozen solid. 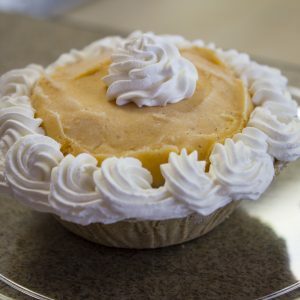 A perfect sized treat if you don’t want to overindulge! 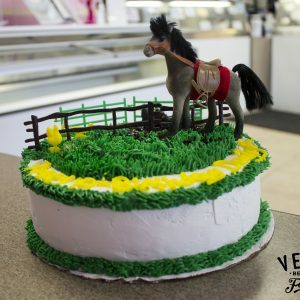 Ice Cream Cake – While not available unless you buy a whole ice cream cake, they wanted me to taste and see a cross-section of one of their more popular cakes that they make. 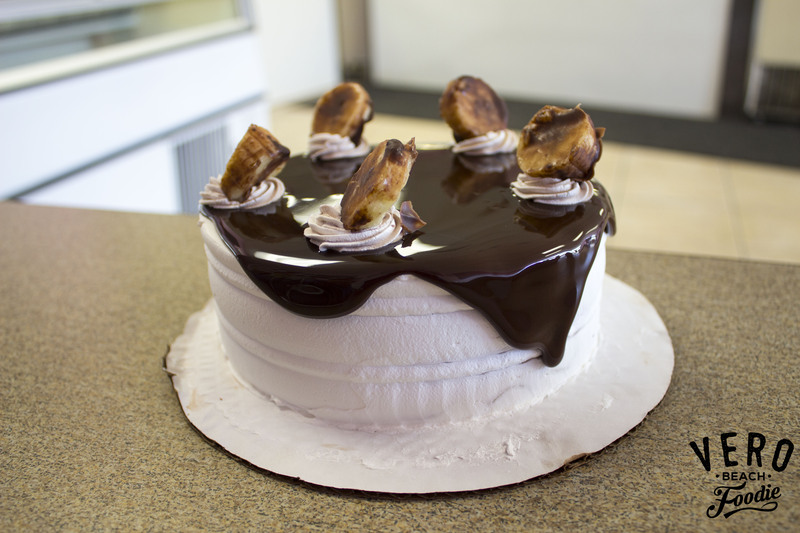 From the bottom up: Pureed bananas in vanilla ice cream, chocolate cookie crumble, chocolate ice cream, a decadent layer of hot fudge, and garnished with whipped cream and a chocolate covered banana slice. All of the flavors worked very well together. 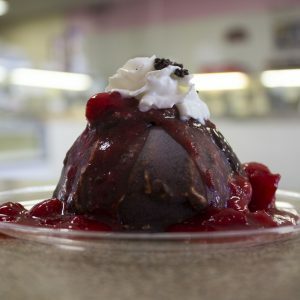 The hot fudge was some of the best I’ve ever tasted, the chocolate cookie crumbles added a nice texture variation, and the chocolate ice cream was smooth and creamy. 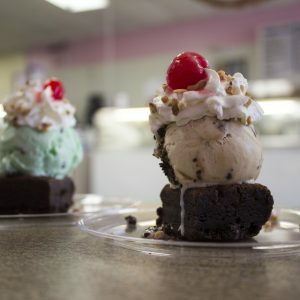 Brownie Boat – Since we were tasting quite a few different items from the menu, we were provided smaller tasting portions of some of the desserts. For example, we were told this is 1/8th of the normal size, so the normal one must be HUGE! 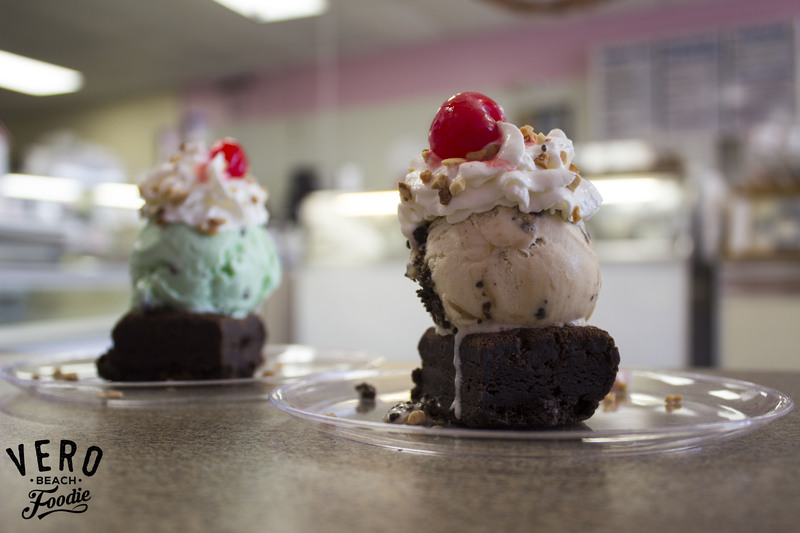 You get to choose the ice cream that goes on top and I chose a scoop of Peanut Butter Crunch which was the perfect choice with the brownie. 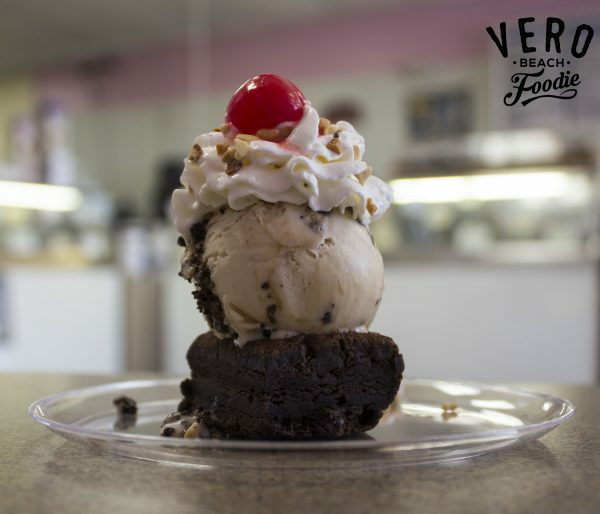 The brownie was moist and fudgy, the ice cream was of impeccable quality and had a wonderful peanut butter flavor. 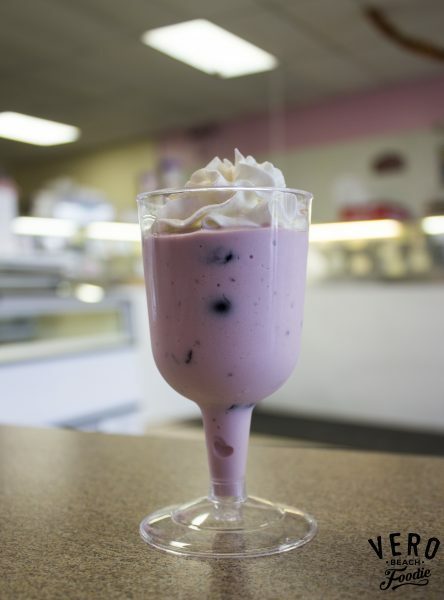 Black Cherry Lemon Smoothie – We were a little hesitant on this flavor combination at first, but we decided to go ahead and try it anyway. Black cherry and lemon didn’t really seem to go together, but surprisingly it worked. The lemon was not overpowering and actually enhanced the flavor of the black cherry a little bit. The smoothie was more milkshake like in texture since it was on the thicker side and had large chunks of black cherry in it. Luffle – What the heck is a “Luffle” anyway? 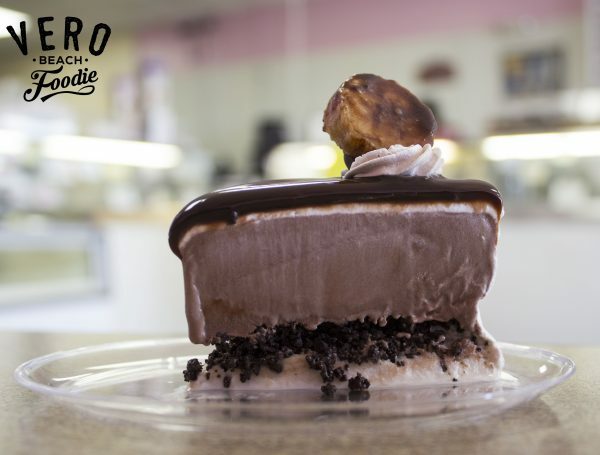 Taking inspiration from a new show on Netflix called Zumbo’s Just Desserts, Ice Cream Cake designer Brittany decided to try something different. 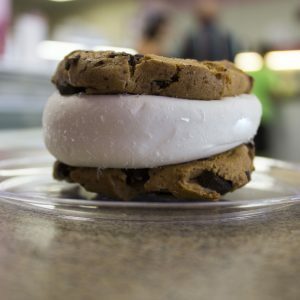 This is one of those “secret” menu items you won’t find on the board and have to ask for it. 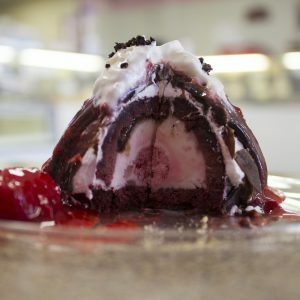 Here are the all of the layers starting in the middle working our way to the outside: Strawberry ice cream, strawberry cheesecake ice cream, hot fudge, red velvet cake, whipped cream, chocolate magic shell and garnished with hot fudge, strawberry topping, whipped cream, and chocolate cookie and graham cracker crumbles. 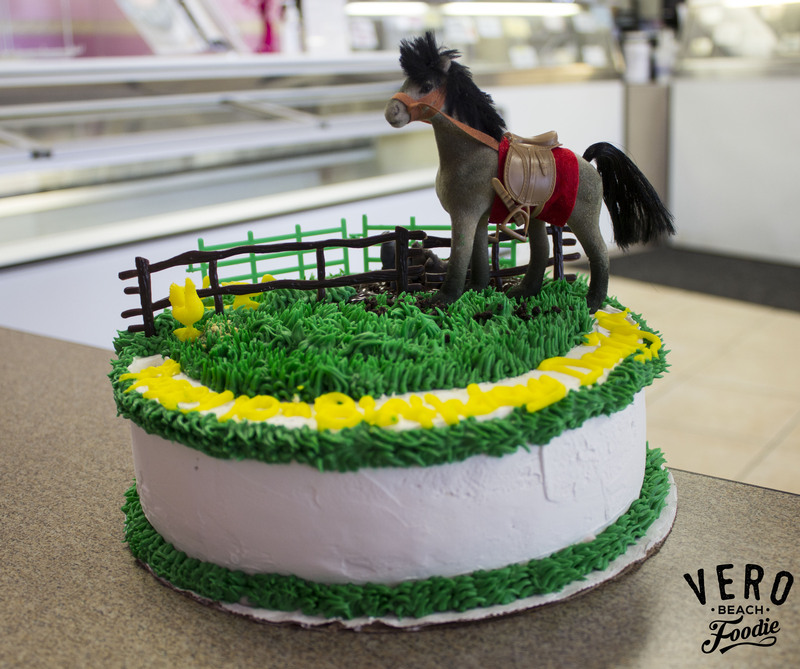 It was frozen solid, so we had to let it warm up a bit before we could eat it. 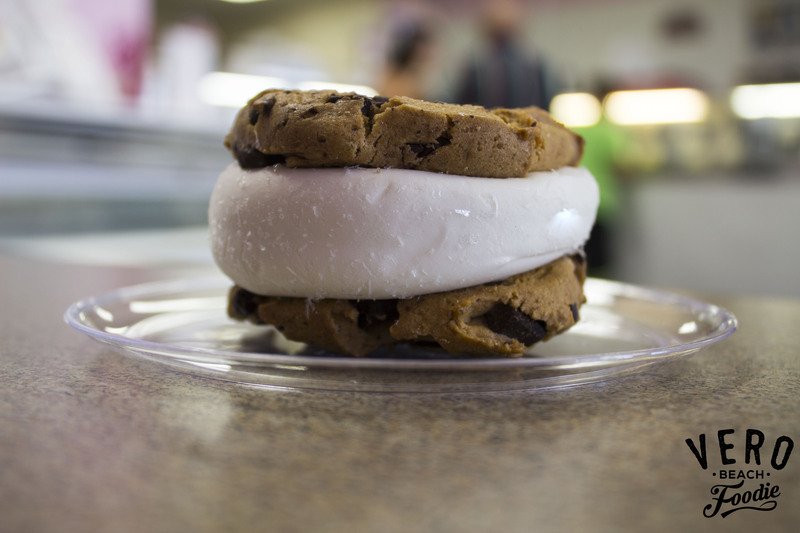 It was quite complex in both flavors and textures and was really good! 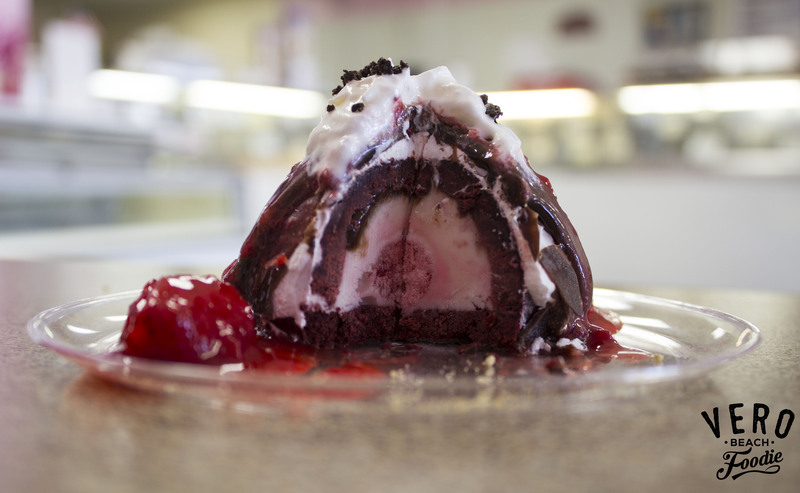 To see what the inside layers look like, check out my photo gallery above for an inside peek at this dessert. 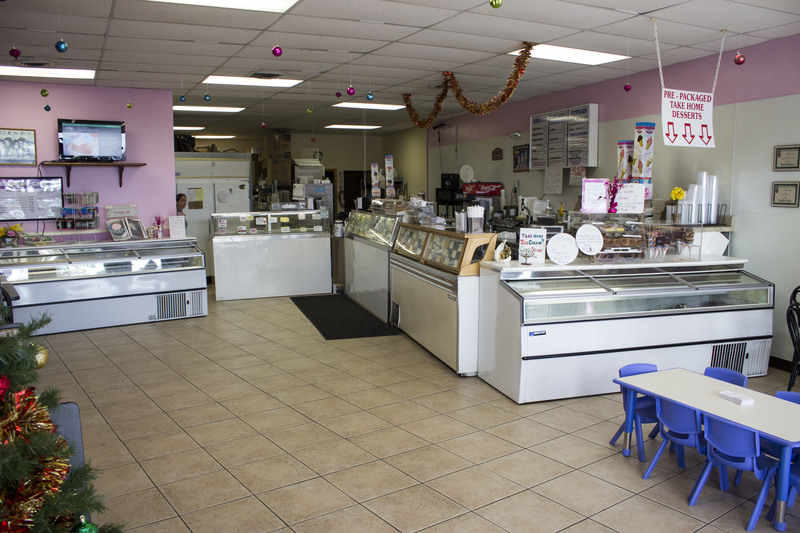 It’s always fun to discover a new and interesting place to try, and I’m happy to have found Joy’s Ice Cream Plus. 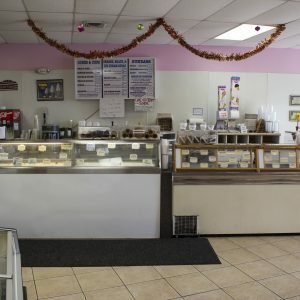 Having been in business for over 21 years, they must be doing something right. 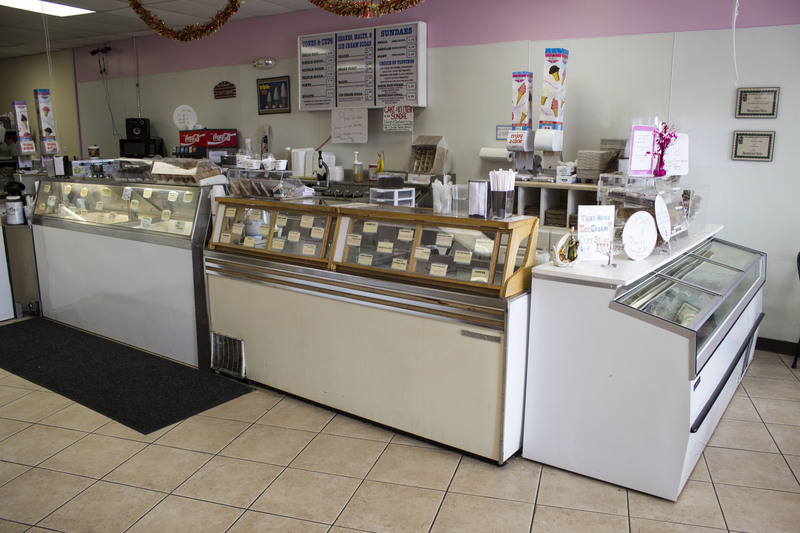 All ice cream is made in-house, and with over 50 flavors to choose from, the possibilities are endless. 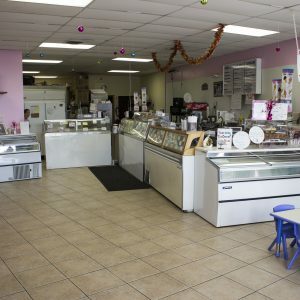 From one ice cream lover to another, next time you are in the Fort Pierce area, I HIGHLY recommend you go check these guys out, I know you won’t be disappointed! 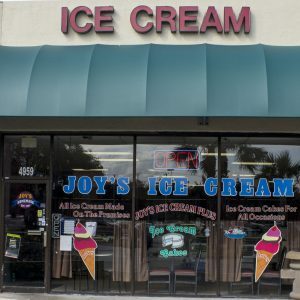 Have you tried Joy’s Ice Cream Plus? What has your experience been with them? Sound off in the comments below and let me know your thoughts, or feel free to email me at thefoodguy@verovine.com with your questions or comments. Thomas Miller, aka "The Food Guy" is big on organic everything and very particular about his butter.He has reviewed over 125+ local restaurants in the last 3 years and is invited by Disney to review the EPCOT International Food & Wine Festival every year.His food photos are devoured by 10's of thousands monthly on VeroVine.com and as a Google Maps Local Guide, his photos have been viewed over 6 million times.His foodie tribe is over 4,800+ people right here in Vero Beach and his VIP Foodie Dining Experiences are some of the Top Culinary experiences in Indian River County and beyond. We just found it last month. It was outstanding! 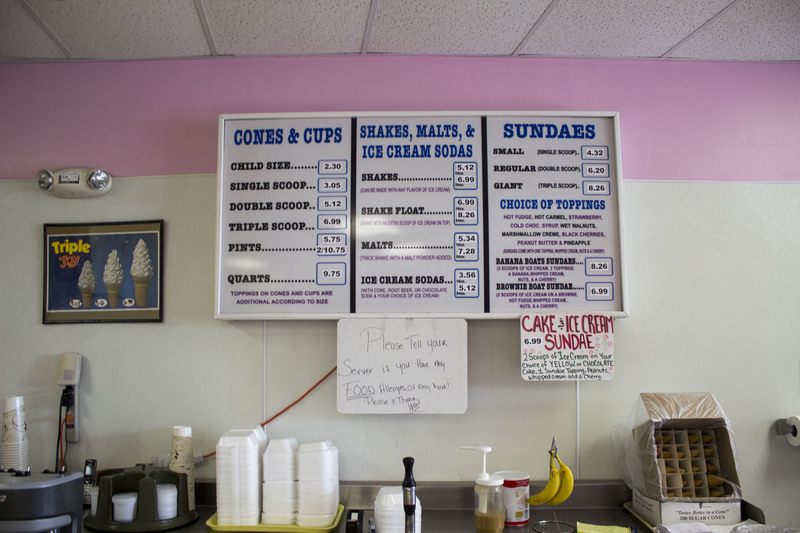 We just had their basic ice cream cones and they are extremely generous helpings! It’s worth the trip. Wish they had a store in Vero!